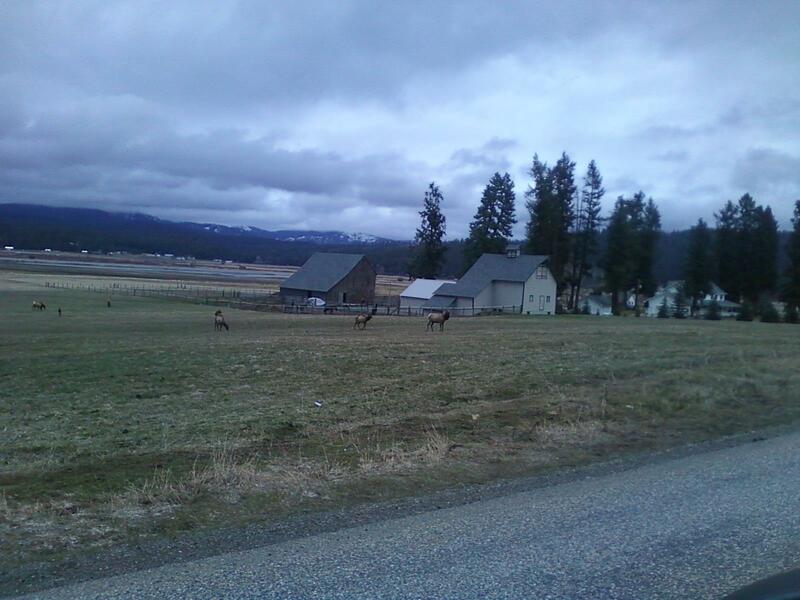 It's spring again, which means there are more animals out on and around area roads. This is part of a herd of elk that's been out every morning recently near Stateline. 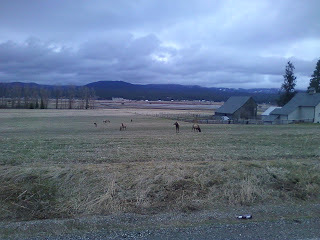 They, like deer, turkeys and a lot of other wildlife, are coming down to lower areas, and crossing roads to get there, to eat in the fields. 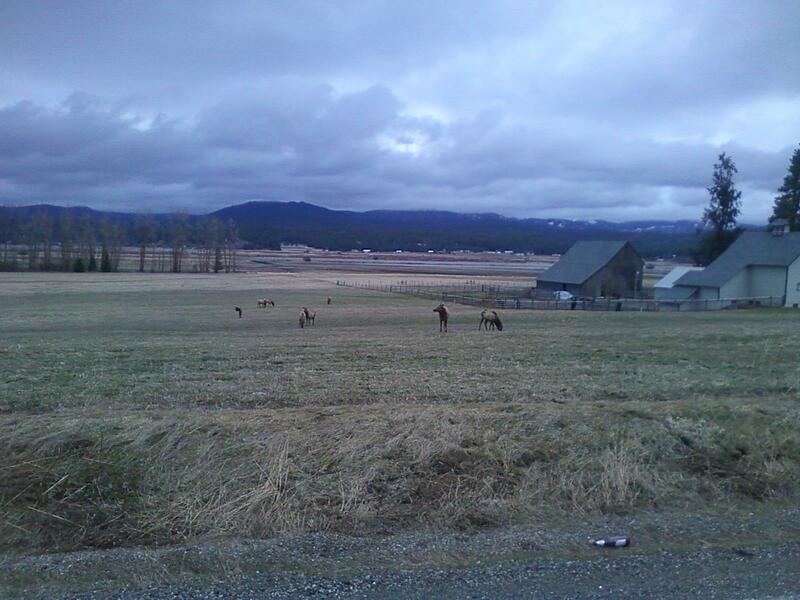 So be alert while driving in outlying areas, those guys critters can be quick and sneaky. Is A Car Essential For Your Commute? Is a car essential to your commute? A new study concludes that 4/5ths of research participants felt car ownership was not essential to their everyday commute. Of course, the study was done in Boston and San Francisco so that weighs into the results. The study found that autonomy was more important for commuters than the status or comfort associated with car ownership. Especially in the presence of ride-sharing services, study participants agreed that car ownership was not essential to their lifestyle. The City Fix blog has more of the study results. 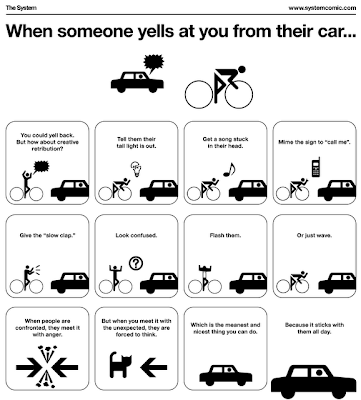 Okay, not necessarily transportation-related, but this cracked me up. We just got out of a staff meeting where the subject of the 'KMPO coffee fund' came up. 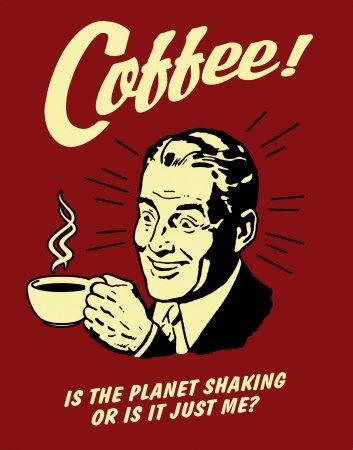 Not everyone around here drinks coffee so only the six people who do pay into the fund. The fund pays for bags of coffee, usually purchased at Costco (where's it's less expensive), to be made in the office coffee maker. 7th Street and Sherman will be updated. The first phase of the project will take approximately one week and will take place mostly in the parking strip and sidewalk. During this time, there may be temporary traffic and pedestrian disruptions. The second phase involves extending the water main from the alley south of Sherman and 5th Street, north to the water main in Sherman Avenue. Additional information will be sent out prior to starting this portion of the project. We talk a LOT in my line of work about reducing carbon dioxide emissions, finding alternative modes of transportation and reducing vehicle miles of travel. Well, in Europe they're apparently tired of talking and are proposing to do something about it. The European Union recently released a plan aimed at cutting carbon dioxide emissions- and it involves banning all vehicles from city centers in the future. Not all areas though, just the major cities. Still, a lot of folks are calling the plan 'crazy' and 'extreme.' Here's more from London's newspaper The Telegraph. The Spokesman-Review's Eye on Boise blog is reporting that the Idaho House will debate a plan to strip millions in funding from driver's education classes, essentially ending a subsidy for programs offered through public schools. Republican Rep. Steve Thayn of Emmett says his bill, introduced Friday in the House Education Committee, would boost the private share of driver's ed classes to $325. It sits at about $200 now. The measure would redirect $2.2 million annually to the public school rainy day account and $100,000 to the Idaho Transportation Department. Another $1 million now in an account for the driver's training programs would be returned to Idaho state government's general fund. Thayn says these changes would likely spur private driver's ed businesses, but insists his main goal is to have a debate about spending priorities. I know a lot of folks who are already having a hard time scraping up $200 for drivers ed considering the state of the economy. But then again, is it really a priority in your household that your teenager be able to drive? What are your thoughts on this? Snoqualmie Pass over I90 was closed earlier this week due to a rockslide. It was reported that one of the rocks was the size of a pickup truck, and here's the picture to prove it was big. Holy cow, can you imagine driving along and looking up and seeing that thing coming down the hillside?! Luckily, a 'rockfall fence' caught it before it could get onto the roadway. Here's the whole story of what happened, and how WSDOT and other crews got the road open again quickly. I posted last week about a joint Board meeting we're holding next week between the KMPO Board and our 'sister' agency in Spokane County, Spokane Regional Transportation Council. The meeting is to discuss results from the 2010 Census that have come back recently showing population growth in both Spokane and Kootenai counties. Growth such as that has the potential to affect how metropolitan planning organizations work with federal programs. The agenda for that meeting is now available here. The meeting is next Thursday, March 31 from 11:30 a.m. to 1:30 p.m. at the Garden Plaza in Post Falls. The address is on the agenda. The meeting is open to the public so feel free to attend. This is truly amazing. Even in times of catastrophe, the Japanese are extremely industrious. 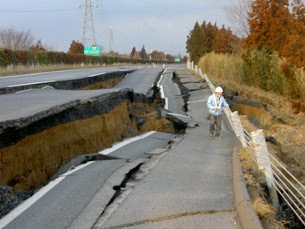 The picture to the left is a road in Japan that was severly damaged by the earthquake. And,according to autoblog.com,this picture is just six days later after crews worked at a feverish pace to repair it. If this is true, kind of makes us look pathetic. But maybe their quick job doesn't translate to a quality one. Who knows. You can read more about this amazing repair job here. AAA says you can knock off the panic. They say gas prices have either topped off or will before hitting $4 a gallon. And while they still appear to be rising by around 5 or 10 cents per week, the thought is that they'll slow down around $3.75. The Coeur d'Alene Press has the reasoning behind it. If you're one of the many folks who commute to Spokane for work, you've probably already noticed construction projects popping up in Spokane County, and it's only March. So imagine how many there are going to be by the time May rolls around. There are more projects than ever this year, due to cheap contractor and material prices. Several have the potential to delay your commute, especially the project to widen I90 in the Valley and those who work downtown will have to contend with cosntruction on Second Avenue. A new website is aimed at helping you avoid construction, and congestion in general. Go to www.SpokaneRoadFix.net to check it out. Then tell the folks you know who also drive to Spokane. The more people we can get using alternative routes or alternative modes of transportation, the less road construction will slow us down. Megaloads, megaloads, megaloads. I'd never heard the word until recently, now I hear it every day. And we could be seeing them in person. The oversized loads of oil refinery equipment destined for a project in Alberta, Canada, may be detoured north through Kootenai and Shoshone counties. The Idaho Transportation Department is reviewing a proposal from Imperial Oil/ExxonMobil to reduce the size of 33 megaloads at the Port of Lewiston so they can be shipped up U.S. Highway 95 to Interstate 90. The Spokesman-Review has the details. I attend a lot of public meetings because of my job. And more and more I find it's hard to get people to attend. They all have other stuff to do; running the kids to school functions, grocery shopping, working late, etc. That makes it hard to get public comment on potential future transportation projects, and its SO important to gauge the public's opinion when you're spending that kind of money. Detroit may have found a way to get people to comment on a light rail line, and it uses Lego people. I wish my budget was big enough to buy Legos AND a video camera. Ronald Johnson's research (Wikipedia) and conclusions regarding natural gas as a vehicle fuel don't fully tell the story. With 16 years of experience managing a fleet of city vehicles for a California city, I have been through it all regarding alternative fuel vehicles - propane, electric, CNG (compressed natural gas), etc. CNG vehicles were available in three different options - after market bi-fuel (gasoline/CNG), vehicle manufacturer bi-fuel and dedicated CNG. Overall, CNG is a safer fuel than gasoline and has a higher octane rating (105+). However, CNG has a lower gge (gasoline galion equivalent), which in real world operations, is about 95 percent of a gallon of gasoline. Downside - bi-fuel vehicle engines can't take advantage of the higher octane equivalent of the CNG because the engines have to also run on the lower gasoline octane. Upside - a dedicated CNG vehicle's engine is manufactured to utilize all the power of CNG such as a higher compression and other engine computer control tweaks. In regular city day-to-day operations, the actual loss of fuel economy for any CNG powered vehicle was very minor compared to the significant fuel cost savings. The only concern I would have is to ensure there are qualified mechanics or service facilities to maintain the CNG vehicles and there are both slow fill and fast fill CNG refueling available. My best fleet vehicles were the Ford dedicated CNG F-150, the Honda Civic CNG and the Honda Civic Hybrid and a Tymco CNG street sweeper. These vehicles saved me a ton of money in my fleet fuel budget and over the years as the CNG fleet grew I even had annual reductions in the budget. I found this letter, in response to a CDA Press story last week on the possibility of eventually converting Post Fall's fleet of vehicles to CNG, pretty interesting. I know very little about CNG and hadn't heard much at all about it until recently. Anyone have any additional info on CNG, pro or con, to share? If you're taking a train anywhere tonight or tomorrow, you could be rerouted due to a derailment near Bonners Ferry. 25 cars came off the track, spilling a large amount of grain that was being hauled. The Coeur d'Alene Press has the details. A Coeur d'Alene woman has been named Adopt A Highway volunteer of the year by the Idaho Transportation Department. That's right, she's one woman but she's done as much as any group, picking up over 1,000 pounds of trash along U.S. 95 all by herself. The Coeur d'Alene Press has Katie Burke's story. Traffic interruptions on Sherman Avenue in Coeur d'Alene could begin as early as March 28th when work begins a project in advance of this summer’s planned overlay. The project consists of two phases: (I) work on water services and (II) a water main extension. Work begins as soon as asphalt is available for road patching. The first phase of the project will take approximately one week and take place mostly in the parking strip and sidewalk. During this time, there may be temporary traffic and pedestrian disruptions. Business access will be maintained at all times. Phase II involves extending the water main from the alley south of Sherman and 5th Street north to the water main in Sherman Avenue. The extension of this water main will involve the temporary closure of Sherman Avenue during that portion of the work on Sherman Avenue. 5th Street will remain closed during the entire phase. Phase II will take approximately two weeks. Here it comes, those high gas prices we keep hearing about. Hawaii just became the first state to have unleaded gas reach $4 per gallon. The Idaho Press Tribune rounds up some of the gas prices around the nation. For those of you who commute to Spokane for work or school, a warning that a project to widen I-90 in the Spokane Valley starts on March 28, so you may want to leave a little earlier to get where you're going. The Interstate 90/Sullivan Road to Barker Road widening project will add a third lane in each direction through this 2.8-mile section of I-90. Crews will remove the existing asphalt pavement then rebuild the highway with a more durable Portland Cement Concrete Pavement (PCCP) surface. This section of the freeway was built in the 1950's, when traffic volumes were significantly lower. The plan is to continue widening the freeway, in stages, to Liberty Lake and eventually the state line, as funding becomes available. Besides moving more vehicles, this widening helps to move freight more efficiently. Traffic will flow freely through the project with two lanes in each direction during most of the construction. Crews will build temporary pavement and lanes, so all the freeway traffic can use one side of the existing highway. Drivers will need to be alert as they travel through this section. The lane width will be reduced from 12 feet to 11 feet and shoulder width will be only two feet. 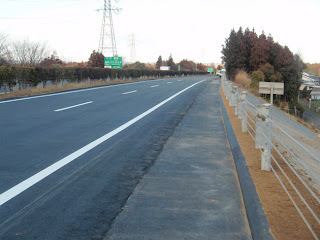 The speed limit will be reduced for the duration of the project. Construction on the $15 million project should be complete by late fall. Keep watching here, because all of the agencies that deal with transportation in the area are coordinating on a campaign to keep congestion to a minimum this construction season. I'm hoping to be able to tell you more next week. Medal of Honor recipients from Idaho will soon be honored throughout the state with the naming of highways. Gov. Butch Otter recently signed into law Senate Bill 1050, which designates Highway 3 as North Idaho's Medal of Honor Highway. The Coeur d'Alene Press has the story on how many area Medal of Honor recipients there are and which highway will be named after them. Mark your calendars, the Kootenai County Area Transportation Team (KCATT) meeting is next Tuesday, March 22. The KCATT is the technical advisory committee to the KMPO Board. Here's a look at the meeting agenda. All KCATT meetings are open to the public so feel free to attend. It's at the Idaho Transportation Department District One Headquarters, 600 W. Prairie Avenue, in Coeur d'Alene at 8 a.m. I posted a thread earlier today in response to the Idaho Senate passing House Bill 160, which protects doctors from lawsuits if they recommend that a patient's driver's license be revoked due to age or health issues. It was a link to a Coeur d'Alene Press story about how you know when it's time for an elderly driver to give up driving, and who is responsible for enforcing such a move; the driver's family or the government. A gentleman who started 'Keeping Us Safe,' a campaign to keep older drivers safe, posted information on some of the resources his movement offers. Matt Gurwell is a former Ohio State Trooper and what grabbed my attention about his campaign is why he started it. He says it was the result of 20-plus years of holding dying people in his arms at accidents scenes and delivering death notifications to families. Among other things, Keeping Us Safe offers a self-assessment program for older drivers, a course in identifying signs of decline in the elderly and a workbook called "Beyond Driving with Dignity" that was developed to offer families a roadmap on how to address the issue of driving safety with an older adult in your family. So if you have an older driver in your family, you may want to check out the Keeping Us Safe website. Hammond said he doesn't plan to do away with any of the existing specialty plates, but that any further specialty plates would have to support a general government good as he doesn't believe Idaho's government should be in the business of raising money for private causes. Current specialty plates include ones to benefit the Special Olympics, the National Rifle Association, an “Idaho Freemason” plate and the “Corvette, America's Sports Car” plate. Older Drivers; Who Makes The Call When Its Time To Quit Driving? Many of us have had to face telling a loved one that they are no longer fit to drive, for either health or other reasons. While it's painful, would you rather have the government break the bad news to your loved ones, in the form of a law? The Coeur d'Alene Press looks at the issue of elderly drivers who may not be safe anymore and if a law is needed to get them to hang up the keys. For those of you who can't get enough of our KMPO Board meetings, you get a bonus this month. KMPO and Spokane Regional Transportation Council (SRTC), the Metropolitan Planning Organization for Spokane County, WA, have called a special joint Board Meeting for Thursday, March 31 from 11:30 a.m.-1:30 p.m. at Garden Plaza, 545 N. Garden Plaza in Post Falls. The KMPO Board contracts with SRTC for day-to-day administrative and planning duties. We're getting the two boards together because 2010 Census results show population increases in both Kootenai and Spokane counties. That could mean some implications for each area, although we're not sure what kind yet. Representatives from the Federal Highways Administration, Federal Transit Administration, and the U.S. Census Bureau will make presentations and answer questions from the Boards at the meeting, related to affects the 2010 Census may have on the two counties. Members of the public are welcome to attend, as always, so come check it out. A meeting agenda will be posted here soon. I've had a lot of people mention to me lately that their vehicles have names. My friend Becca's Durango is 'Dusty,' Angela's Jeep is the 'Valdez' (because of how much oil it leaks) and Holly has a name for each of her many bikes. So I was wondering, have you named your car, bike or other mode of transportation? The Idaho Transportation Department is giving you warning that a bridge rehabilitation project on the U.S. 95 Blackwell Slough Bridge south of Coeur d'Alene will create significant impacts to traffic beginning March 18. The highway will be reduced to one lane on a 24-hour basis, until about mid-April. The bridge deck will have a 1.5-inch layer of concrete removed. Damaged areas will be repaired, and the bridge deck will be overlaid with a new concrete surface. The project also includes bridge joint repairs and resurfacing bridge approaches with asphalt. The support piling located in the slough will be painted when weather permits. The contractor on this project will work seven days a week from 7 a.m. to 7 p.m. During construction, the speed limit will be reduced to 25 mph in the work zone. 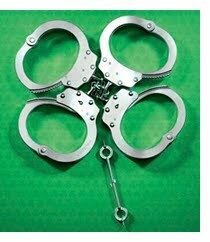 I know that many celebrated St. Patrick's Day on Saturday with some green beer, but if you plan to go out on Thursday as well, don't depend on good luck to get home. The Idaho Transportation Department wants to remind you to make the right choice to not drive impaired. A statewide impaired driving high-visibility education and enforcement campaign is under way through March 22. ITD’s Office of Highway Operations and Safety works to reduce deaths and injuries from traffic crashes by utilizing federal funds to address dangerous driving behaviors. This effort is part of the department’s commitment to achieve a goal of zero deaths on Idaho’s highways. Who Is The Father Of The U.S. Interstate System? Here's a fun fact that BiketoWork Barb sent me: do you know why Dwight D. Eisenhower is called the 'Father of the Interestate System?' After taking office in 1953, President Eisenhower made revitalizing the Nation's highways one of the goals of his first term. In the army in 1919, Eisenhower had travelled across the U.S. and saw the poor condition of our roads. During his World War II stint as Commander of the Allied Forces, his admiration for Germany's Autobahn highway network reinforced his belief that we needed a better road system. When elected president, Eisenhower formed committees to study the idea and met with Members of Congress to promote the proposal. When legislation failed in 1955, observers predicted that in the presidential election year of 1956, the Democratic Congress would not approve such a significant plan sought by a Republican President. Eisenhower continued to urge approval though and worked with Congress to reach compromises that made approval possible, signing the Federal-Aid Highway Act on June 29, 1956. Here are some more fun interestate facts from the Federal Highway Administration website. 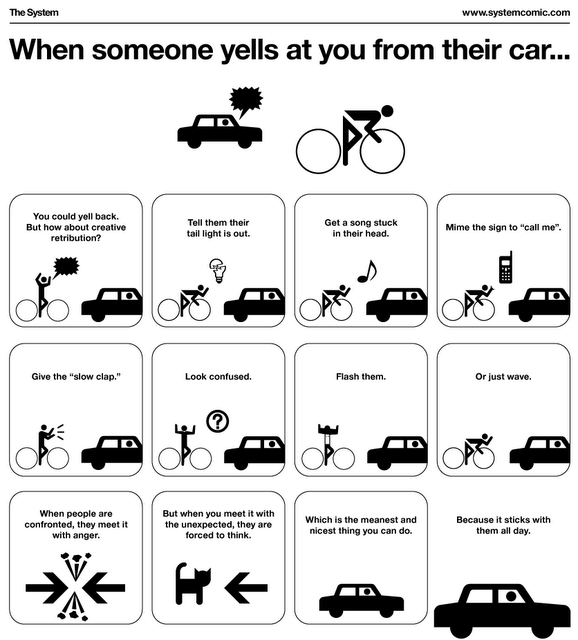 I stole this graphic from the Coeur d'Alene Pedestrian and Bicycle Blog so call them if you have complaints ;) It's Friday and we all need a break, and a laugh, so read this and enjoy it but don't actually do it. Especially the flashing part. Cause I can't endorse or encourage you to do anything that might get you beat up by an angry driver. I do like the 'call me' sign and the 'slow clap' though and may try it myself. Will report back if I get the nerve to do it. As for the cat, I don't get that but it seems like any graphic is enhanced by a cartoon cat. Just click the graphic to see it full size. High gas prices are prompting people to change their ways- including businesses and government agencies. The City of Post Falls has gone so far as to explore converting some of its larger vehicles from diesel to compressed natural gas! The Coeur d'Alene Press has the story. Usually I ride the bus to work a couple days a week and drive a couple days a week but I've been making an effort not to drive at all the past couple weeks. Have you made any changes to your habits due to gas prices? 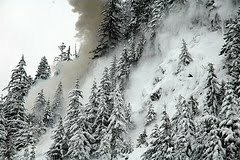 These are pictures of avalanche control work at Snoqualmie Pass. The Pass is currently closed down so crews could bring down a buildup of snow that could otherwise result into a slide onto the roadway. Eastbound traffic is stopped at milepost 47 near Denny Creek and milepost 56 near Gold Creek. Westbound traffic is stopped at milepost 61 near Price Creek. Due to the nature of this type of work a reopening time can't be estimated. We'll keep you updated. 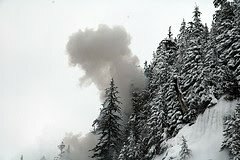 While you're waiting though, here's a very interesting entry from the Washington State Department of Transportation blog on how avalanche prevention work is done. I want to get paid to 'play' with explosives. The Joint Finance-Appropriations Committee has approved the Idaho Transportation Department Board's recommendation for GARVEE bonding for next year, voting 17-3 for it. The bonding plan totals $162 million, and is all for construction - $79.4 million for the Garwood to Sagle project on Highway 95 in North Idaho, and $77.9 million for the Idaho 16 project in the Treasure Valley area. GARVEE bonds are paid off with future federal highway allocations. This request is the last in a multi-year effort that paid for major construction projects in seven highway corridors across the state. Here's an interesting item: A bill to protect doctors from legal action after they recommend a patient's driver's license be revoked is headed for a State Senate vote. The Senate Transportation Committee unanimously approved the measure Tuesday and it's been approved by the House. A lobbyist for the Idaho Medical Association says the measure would prohibit lawsuits from being filed against doctors who notify the Idaho Transportation Department when a patient is deemed incompetent to drive. Reasons for incompetence could include Alzheimer's disease, dementia, epilepsy or seizures. Doctors have been targeted in the past with lawsuits filed by drivers frustrated with recommendations to revoke licenses. Making lawsuits illegal would eliminate fear some doctors have about filing reports. The Idaho Transportation Department will get about $562 million for fiscal year 2012, according to a budget the Joint Finance-Appropriations Committee approved Monday. That's up 16.3% - or $78.8 million - from last year. The budget includes $54.5 million in federal stimulus money that is being carried over into the next budget. Without that money, the increase would only be 5%. Idaho's transportation budget includes money from the federal government, registration fees and gas taxes but does not rely on the state's general fund. Here's your cautionary tale for the day: texting and driving isn't the only thing that will leave your car in this condition. Anything that distracts you from paying attention to the road is potentially deadly. The driver of this car was reportedly drinking coffee while driving, when he spilled some on his lap. 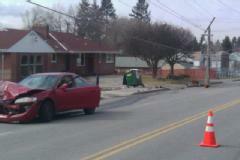 When he bent over to clean it up he swerved and hit a power pole. KXLY.com has the story. Moral of the story: stop drinking coffee, playing with the radio, punching addresses into your GPS, flirting with other drivers, reaching into the backseat, putting on lipstick, talking on the phone, digging for change under your seat, looking for a map in the glove box, cleaning steam off the inside of the window, petting your dog, eating cereal, painting your nails, and anything else that takes your eyes, or your mind, off the road. With gas prices inching up, you may be looking for the cheapest gas around. This gas price finder from MSN Autos can help. You just put in your city and state and it comes back with a list of the cheapest local stations all the way through the most expensive. Legal disclaimer: I'm not sure how often the site is updated. When I typed in 'Post Falls, ID' the prices that came up seemed pretty accurate, but when I typed in 'Spokane, WA' the site said that a place I had JUST gotten gas was selling it for $3.18 per gallon for unleaded when I had paid $3.25 per gallon when I was there the day before. Considering that the trend is for prices to go up, I don't think they dropped by seven cents overnight. It's fun to play with anyway though; gives you an idea who has less expensive prices on a regular basis. I thought I had been noticing a lot of roadkill in the area lately, but nothing compared to the carnage in Montana this winter. Fish and Wildlife officers say hundreds of pronghorn antelope and deer were killed by trains this winter after herds gathered on tracks to escape deep snows. Approximately 800 in fact. The Missoulian has the story. If you live in one of Coeur d'Alene's new neighborhoods, you may be eligible to get free street trees for your neighborhood. The trees are available to homeowners or residents in new neighborhoods who are willing to provide care for them. Interested people should contact the Urban Forestry division of the Coeur d'Alene Parks Department at 415-0415. There are a limited number of trees and they will be distributed on a first-come, first-served basis. Funding for the trees has come from a street tree fee collected on residential building permits. The street tree fees can be refunded to builders or new homeowners who plant a street tree upon completion of a new home. Six months after the completion of a home, unclaimed funds are forfeited to the city. The city is now using these forfeited funds to purchase and plant trees in new neighborhoods. The owners of the homes whose building permit fees were forfeited are the first choice for using these funds. The city has already contacted those property owners regarding the planting program. However, there are still some trees unclaimed. These street trees are being offered to any homeowner who is willing to make sure that the trees are watered and protected from string trimmers and mowers. A drilling crew from the Idaho Transportation Department will perform investigative work on Idaho 41 in Rathdrum Tuesday and Wednesday (March 8 and 9) as part of a project that will eventually replace the bridge connecting Idaho 41 with Idaho 53 in Rathdrum. The work will cause intermittent lane closures near the Rathdrum Bridge intersection with Idaho 53. Weather permitting, work will be done between 9 a.m. and 2:30 p.m. to avoid interfering with nearby school traffic. The highway will be reduced to one lane for 15 to 45 minutes at a time. Flaggers and signing will guide motorists through the work zone area. I've worked in several fields in my life including construction, the media and now transportation planning. I have found that the folks in the transportation planning field tend to be a little more passionate about what they do. To the point where we forget to take care of the basics sometimes. To illustrate, the picture below is what greeted me on our in/out board when I got into the office this morning. Know what it says? It's a reminder to fill out our timecards or we don't get paid. Makes perfect sense. Citylink numbers are holding strong for the most part. The monthly ridership report for February can be viewed here. Well, one thing you can say about Los Angeles is that they don't do anything half way. Someone made a comment on this blog a while back about maybe by the year 2015 we'll have four more miles of bike facilities within the City of Spokane. Okay, we're nowhere near the size of L.A. but get this: L.A.'s City Council just approved a new bike master plan that calls for 1,680 miles of interconnected bike paths! The City of Spokane only has about 971 miles of roadway, so L.A. will have more miles of bike facilities than we have miles of streets! Crazy. But awesome. Here's how they plan to implement this plan. An opinion piece in today's Spokesman-Review says a proposed distracted driving bill doesn't have any teeth- because the bill wouldn't actually prohibit people from texting while driving. Read the piece and let me know what you think. Have you noticed the increase in gas prices? It seems kind of hit-and-miss. My left side went numb yesterday when I pulled into a Liberty Lake gas station and saw the price for regular was $3.29 per gallon. I passed on that station and went across the freeway, about two blocks away, to a station that was selling regular for $3.13. Much better. This Spokesman-Review article talks about the jump in gas prices in the just the past couple days and how that's affecting area drivers and businesses, in Spokane and Kootenai counties. The Spokesman-Review's 'Eye on Boise' blog reports that the Idaho State Senate has passed a measure that would allow school buses to sport corporate logos and ads. The bill would give school districts the option of selling ad space on the sides of buses. Assistant Majority Leader Chuck Winder of Boise, who proposed the bill, says it's another step to help schools deal with their budget crisis. The measure gives the State Board of Education authority to determine what ads are acceptable, and bans political campaign ads. Opponents argue school bus ads are distasteful and taint the image of an American icon. About half a dozen states already allow school bus advertising. What are your thoughts? Is it okay to advertise on school buses if it helps bring in money to pay for education? Here's one I haven't heard before: an opinion piece in the Detroit Free Press suggests levying a percentage tax on crude oil in order to fund hundreds of billions of dollars of transportation improvements and shore up the depleted Highway Trust Fund. Gas taxes currently support the Trust Fund, but are dwindling because new technology has improved gas mileage, translating to less taxes paid for gas. The tax is bringing in less that what the government is paying out for transportation, so the Free Press writer says collect the tax at refineries and adjust the rate quarterly to account for changes in the price of oil.